Click image to launch animated map. The forward operating base that I was stationed on my first deployment to Afghanistan was located far from any hard surfaced roads or large cities. Logistical support to our base was a nightmare and mainly consisted of helicopters and heavy drops by aircraft on a small drop zone outside the wire. We did have some jingle trucks driven by locals that would take a 3 day drive from the larger air bases to bring us some supplies. However, these trucks did not have any security and were often ambushed and hijacked. I even recall one brave driver who was shot in the shoulder but continued to drive on to our base. Once he arrived within our gates, he passed out due to blood loss. We were shooting our howitzer cannons everyday and this required frequent ammunition resupplies. It soon came to the point that most of our ammo was coming in the form of parachute due to different variables effecting helicopter operations. Our drop zone was located just outside of our tiny base but required a good number of troops to quickly and effectively account for everything that was dropped. Of course we still maintained firing capability within the base…because you never know what will happen. 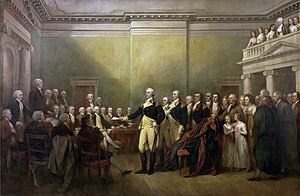 “Happy in the confirmation of our independence and sovereignty, and pleased with the opportunity afforded the United States of becoming a respectable nation, I resign with satisfaction the appointment I accepted with diffidence; a diffidence in my abilities to accomplish so arduous a task; which however was superseded by a confidence in the rectitude of our cause, the support of the supreme power of the Union, and the patronage of Heaven.